When it comes to selling your home, like most homeowners, your goal is probably to sell your property quickly for the price you set while providing a high return on your renovation investment. Choosing upgrades for your home can be a risky proposition — if you sink money into areas of your home that don’t add value, you might as well flush your renovation budget down the drain. 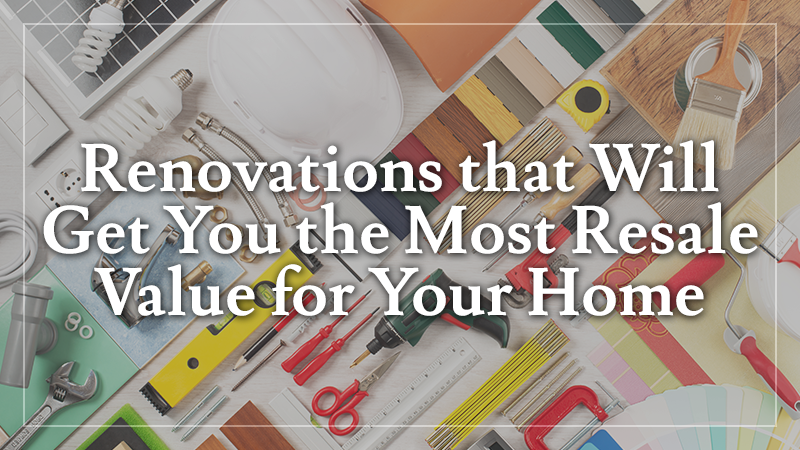 Knowing what improvement projects you should undertake to get your home in tip-top shape and impress potential buyers will help you maximize your return on investment while reducing your overall renovation budget. Here are the top five projects you should consider to make your home more attractive to buyers. First impressions matter. If your front door sports peeling paint, deteriorating roofing, or if the walkway is buckled or cracked, you’re making a bad first impression. A shabby exterior can make prospective buyers question whether you’ve put much effort into maintaining your home’s interior. Presenting an attractive exterior is important as it will tempt buyers to come inside and see the rest of your home. Siding, windows and door replacements are some of the best renovations a property owner can undertake, according to “Remodeling Magazine,” because they improve your home’s curb appeal. 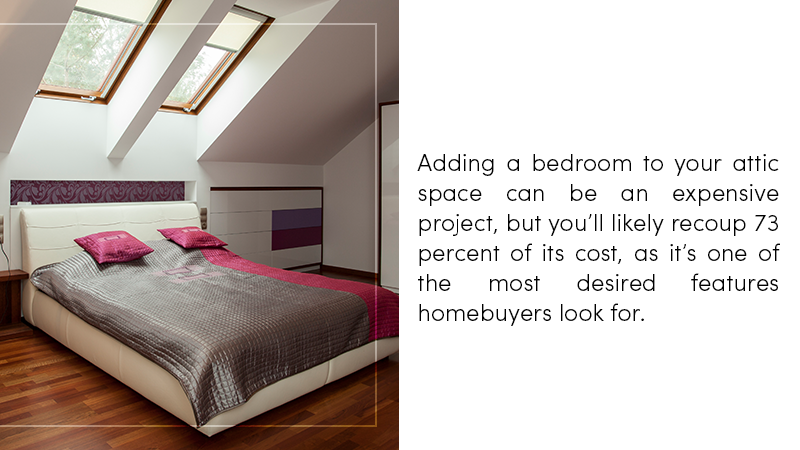 Adding a bedroom to your attic space can be an expensive project, but you’ll likely recoup 73 percent of its cost, as it’s one of the most desired features homebuyers look for. Adding square footage has a positive effect on your selling price as well. If your family bathtub, shower and counters are in relatively good condition, the least expensive and quickest makeover is replacing the sink, shower and tub fixtures. For many homes, this simple upgrade, combined with matching towel racks and toilet holder is all that is needed to improve its appearance. However, in most cases, your master bath will need a renovation, as homebuyers expect it to provide a more luxurious ambiance. The good news is that although a standard upgrade will run about $17,908, it will provide a 65.7 percent ROI. Your master bedroom is easily the least expensive and easiest room to remodel. Because the new homeowner will be sleeping there every night, they appreciate minor luxuries that make the room more inviting. Replace worn flooring with carpeting, hardwood or laminate, and paint the walls and ceiling a soothing, neutral color. Invest in little details like ceiling fans, recessed ceiling lights, crown molding and dimmable switches. Another inexpensive upgrade that homebuyers look for is a custom closet organizer system. Whether you are doing the renovations yourself or working with a contractor, when you are investing in a remodel, it is crucial that the project is completed on time and within your budget. For more information about how to improve your home’s value through thoughtful upgrades, call L&L Contractors today.